If you are in middle management, you live with daily ambiguity, lack of control, and even chaos. To get anything done, you must present your ideas to decision makers, and those presentations can be brutal. Careers and projects can come unwound in a matter of minutes if a presenter at the top level doesn’t know the rules. Fear in the middle creates fog at the top, and bad decisions are made. The stakes are high—one presentation can make or break a career—but the rules are utterly unclear. Or at least they used to be. 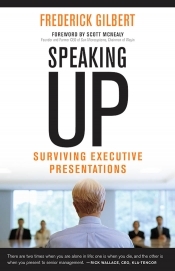 Speaking Up is an indispensable resource for anyone who needs to know how to present to those higher up the chain. It offers revelatory insights into the minds of the men and women at the top—information that is crucial to understanding what they’re looking for from presenters. Tactics and techniques that work well with peers, subordinates, and immediate supervisors may actually work against you when presenting up the chain. Psychologist and coach Frederick Gilbert shows why these high-level presentations are about one thing: delivering information to help extremely talented, highly stressed people make good decisions—fast. Gilbert focuses on three simple rules for “speaking up”: (1) know the people, (2) get to the point, and (3) improvise. Based on ten years of research and hundreds of interviews, Gilbert’s book is unique in featuring extensive comments from executives explaining exactly what they want and don’t want in a presentation, as well as midlevel managers’ stories of triumphs and tragedies and what they learned as a result. This a must-read book for surviving high-stakes meetings.